Mr. Prayat Punong-ong, President, Christian Foundation for the Blind in Thailand/Disabled Peoples' International (DPI), Bangkok. Mr. Bienvenido Rola Officer-in-Charge, a.i. Mr. Brian Heath Officer-in-Charge, a.i. Mr. David Lazarus Officer-in-Charge, a.i. This paper has been well-researched given the limited information available. An evaluation of the situation of disabled women in eleven countries of the region is made with more emphasis given to the author's own country (Bangladesh), India, Pakistan and Thailand where information on socio-cultural and educational situations is more available. The author describes some of the inadequacies of the existing systems for servicing disabled women in the region and reminds us of the large gaps in the public education/information that still remain to be filled before prejudices and ignorance can disappear. She explains that improving the communication capacities of the non-disabled to communicate with the disabled is one important factor in the integration of the disabled in society. She concludes by saying that disabled people have immense potentials which remain untapped. These can be put to productive and profitable use to benefit the family, the society and the country and that a nation's development progress can be measured by the ease with whichintegrates the disabled into the mainstream of society. 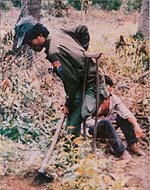 Cambodia's recent history of war, the presence of millions of landmines, continued armed conflict in certain areas, the lack of basic health care and the absolute poverty of the majority of its citizens all contribute to the fact that Cambodia is a country with a high number of disabled people, many of them in what would be their productive years. There are no national statistics available in Cambodia; however, it is thought that 2–3% of the population of Cambodia is disabled, making the per capita rate of disability one of the highest in the world. Due to the seasonal nature of agriculture, off-farm activities are crucial for farmers to earn supplementary income; thus there is also a need to train farmers in such activities. There are vocational training schools and centres but many of these are located in or near Phnom Penh. The majority of these vocational schools teach skills that are not useful for the rural areas and are often not driven by demand or by the local market. In addition, there is insufficient post-training follow-up and assistance with finding employment. Often disabled people cannot attend these centers because they are not mobile or because they cannot leave their families for an extended period of time; others cannot read and write. Few programs exist that provide mobile, short-term training, apprenticeship-style training or that reach the disabled in their own home. Most disabled do not have the funds to start up their own business; thus there is also a need for programs to facilitate their access to credit schemes. Volume 1, published in 1987, describes the activities and the latest situations for the past 5 years, after the inauguration of the Chestnut House built for adult sense and multiple handicapped people. Volume 2, published in 1993, depicts mainly efforts and contributions, given for the construction of another House, named “Plum nut House”, for senior sensorially handicapped people, and also presents the latest situation, activities and development of the Chestnut House. Farm work component: The farms amount to about 1.0 hectare, consisting of many tiny plots of rice fields provided by farmers in the village free-of-charge. Farm work constitutes an important component stressed in the House. This is in addition to special care given to the fellows such as medical care, training on hand conversation skills and cultural education. Of the 900,000 disabled people living in Sri Lanka, about 45,000 have motor or upper limb disabilities. The ratio is estimated to be 75% men and 25% women. Approximately 90% of persons with disabilities live in rural areas. The author stresses the importance of education particularly for disabled children since facilities for them in rural areas are generally lacking. Various types of income earning jobs in which the rural disabled in Sri Lanka are engaged are described. The state of existing health and social services, most of which are located in urban areas, is also explained. The author points out that although traditionally it is considered a family responsibility to look after any member who has a disability, these traditions are eroding. The state has only partly filled this gap due to financial constraints. One important demand that has to be met is the need for any types of aids or equipment for disabled people. This very informative paper provides a lot of details on existing NGOs in the country that are helping the disabled to survive. It also provides basic data on the composition and structure of the disabled population in Thailand. Although critical of the government's low level of financial assistance to the disabled, the author is positive when he refers to government efforts to bring new technology to meet local needs and teach them how to use it. The author suggests that there are many things that can be done to improve the living situations of the rural disabled, such as treating the disabled like others in all aspects of life, giving them names at birth and registering them with their family, providing them with ID cards which recognize them as members of society and teaching general society to recognize the economic capabilities of the disabled so that private businesses can effect changes in their hiring methods. His comments about equal opportunity are well-illustrated when he says; “True democracy, like a limousine and a three-wheeled rickshaw caught in the same traffic jam, comes when the disabled have equal opportunity with the non-disabled population”. The Royal Thai Government has put efforts to expedite the standardization of locally manufactured agricultural machinery. A number of national standards to comply with safety measures, have been established. However, very few manufacturers could fulfill the national standard certification requirement because it would enormously increase the prices of their products, creating difficulty in competition. Notwithstanding with this fact, some large manufacturers have followed some safety precaution measures stated in the national standards. For instance guards or warning signs for dangerous areas can be found in number of locally manufactured agricultural machinery. However, there are no methods or instruments which can prevent accidents better than the awareness and good attitude on safety of the operators and people concerned. Therefore, training on personnel involved in agricultural machinery utilization will be the most important activity to pay close attention to. This paper has been prepared by Dr. Ho Nhu Hai, Vice Director, Department of Social Protection, Ministry of Labour, Invalid and Social Affairs, Vietnam. It provides outside readers with the first complete picture of the current situation of the rural motor disabled in this war-devastated country. As the author emphasizes, a country like his own, now in the process of recovering from a long drawn out war has a lot of renovation to do. This includes the rehabilitation of their motor disabled, of which there are more than 450,000. 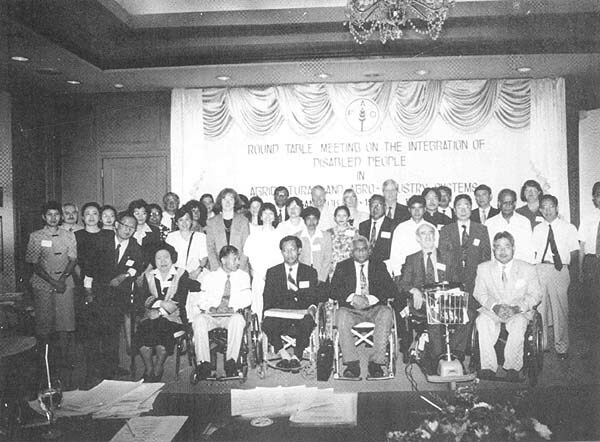 Vietnamese Government policies, which encourage the provision of preferential credits, free primary education, community health and free medical treatment and examination for the disabled and the poor, have helped, but more is needed; however, the author notes that additional coordinated support from donor, specialized UN agencies like FAO and NGOs will be necessary to adequately address and cope with this immense problem. The author's review of the status of the mentally disabled in Thailand reminds us how much still has to be done. In her conclusions, she states the truth with the sentence that “society must learn to deal with and accept the mentally disabled as different”. Thus, it is up to us to find the ways and means to improve the existing situation. She suggests that “an apprenticeship approach” with relation to theory, education and vocational guidance, should allow easier integration of the mentally disabled into society. Increased agricultural production is prerequisite to alleviation of rural poverty. But of itself, agricultural growth is not sufficient to eradicate poverty. Nor can it create adequate opportunities for enhanced rural employment, income generation and economic access to food. Two basic issues emerge when looking at the rural sector of the Asia and the Pacific Region. Prospects are bleak for countries depending mainly upon agricultural production, to absorb an increasing labour force. On-farm employment potential is diminishing. Relative purchasing power of rural populations is declining, cutting into their capacity to ensure adequate nutrition. Exports of primary products have shrunk or suffered in terms of monetary return due to inequitable trade regimes, inflation and other reasons. Employment objectives must be explicitly integrated into rural industrialization strategy. This calls for appropriate policies, technologies and supporting institutions capable of reaching the village and household levels, providing rural disabled entrepreneurs with necessary incentives. These can unleash dormant creativity without alienating producers from their setting. Adaptive to urban/sub-urban areas of production: Production of horticultural crops which requires less area but intensive cultivation practices are adaptive to be produced in urban/sub-urban areas even though the cost of land is much higher than in the rural areas, but these areas have the advantages of being close to the markets and other facilities required for a better quality of life of the residents. Esther Dean's concept of a “No Dig Garden” is tailor-made for disabled people, and has wide appeal because it saves time and effort, and is friendly to the environment since it keeps the soil in good repair. She provides a variety of ideas, such as making gardens in pots, placing pots on casters and creating raised garden beds for people with mobility problems. Various horticultural crops can be produced commercially by disabled people with minor modifications in the techniques. These include vegetables, flowers, ornamental plants, fruits, mushrooms, herbs and spices. However, to earn more and having less risk, the producers should produce crops which are on demand in time and place and choose the right kinds of crops. Gardening, whether performed by normal or disabled people, whether for hobby or for career, certainly helps the gardeners both physically and mentally. With numerous reported cases of the therapeutic value of gardening, it is logical to take the concept a step further by stressing the healing qualities of gardening, particularly for those who are being disturbed by disability, chronic illness, or other mental disturbances.